To mark Women’s History Month this March, we spoke to two talented female playwrights, Florence Keith-Roach and Izzy Tennyson, about the difficulties of writing in your twenties, the inherent sexism in female characters, and the complexities of friendship between women. This spring, two critically lauded plays from last year’s Edinburgh Fringe are transferring to the London fringe scene: Izzy Tennyson’s Brute and Florence Keith-Roach’s Eggs. Both Tennyson and Keith-Roach act in their own work and have had a hand in producing it. Tennyson’s play is ‘a semi-autobiographical piece about my time at an all-girls school, which slowly gets darker and darker’. It’s written in monologue form, and Tennyson herself plays the main character, Poppy. Similarly, Keith-Roach plays one of the two characters in her work Eggs, which is about two women in their twenties confronting issues of fertility, female friendship and identity. We caught up with both writers individually to discuss the imminent London productions of their plays, and the challenges they have faced as millennial female playwrights. Whilst Brute focuses on a particularly nasty phase of friendship between a group of 14 year old girls - social demands, betrayal, bullying - Eggs examines how female friendships are altered in your late twenties by societal pressures. The theme will resonate with any woman watching who went to an all-girls school, or has a difficult relationship with a female friend: as Tennyson observes, everyone has their own story about a nasty incident in that kind of environment. Tennyson’s work nails the indescribable dynamics of an all-girls environment, the complex and potent combinations of factors that dictate a girl’s rise to popularity, or the tiny reasons a girl might be shunned and bullied (‘often it’s because they’re overweight’). It captures the intensity of feelings at that age, and how obsessed teenage girls become with being as close to their friends as possible. Keith-Roach’s work Eggs captures an entirely different phase of female friendship: the difficulty of being in your twenties, being told you can ‘have it all’, and then being forced into a pseudo-competition as a result of this, a bizarre mixture of wanting your friends to do well but feeling a slight pang when they announce an engagement, exciting new job or a pregnancy. As women in their twenties, both Keith-Roach and Tennyson are part of a generation that cannot afford housing, burdened with student loans and graduate debt. In the millennial age, you’re actively encouraged to have everything and do everything, and the moment you realise you can’t do that is a particularly pivotal one. It’s curious that lots of writers in their twenties are creating plays that only have one or two characters, written in monologue or duologue form. Perhaps it’s the perfect form to capture the highly personal, confessional style that a lot of contemporary writing employs. Of course, there are already myriad social media accounts that draw attention to sexism in the film and television industry, and the lack of nuanced female characters, from the excellent Tumblr Casting Call Woe to producer Ross Putman’s Fem Script Intros on Twitter, in which he posts descriptions of female characters from scripts he’s actually read, anonymised into the character ‘Jane’. Many of these adhere to the virgin-whore dichotomy that plagues writing about women. Both Keith-Roach and Tennyson are aware of the tired gender stereotypes prevalent in writing at the moment, and their plays seek to combat this. What is most striking about Tennyson and Keith-Roach is that they both have unique and distinctive voices, writing intelligently about issues that are often sidelined: it seems almost unfair to write about both of them at once rather than devoting separate features to their work. If you find time this spring to see them perform, you will discover why Keith-Roach received so many 5 star reviews at the Fringe, and why Tennyson won the IdeasTap Underbelly Award in 2015. Florence Keith-Roach’s work Eggs is on at the Vault Festival until 6 March. A few £16 tickets are still available for performances that weekend. 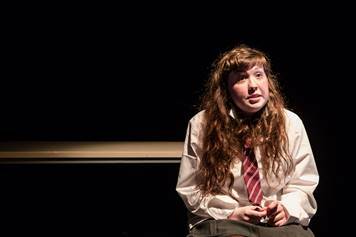 You can get £15 tickets for Izzy Tennyson’s play Brute, which is at the Soho Theatre on 15, 17 and 19 March.